Mmm, luscious pink strawberry ice cream. Soft pink with bits of brighter yumminess. That’s what I had in mind when working up this baby blanket pattern. This pattern is also available on Knit Picks! Row 1: With Color A, use the magic loop* (also called magic ring) technique. [3 dc, 2 ch] four times on loop, join at the top of first dc with a sl st. Pull loop tight. *you can also start this like a traditional granny square: ch 3 , 2dc, [ch 2, 3 dc], rep [ to ] 2 times, ch 2, join to the top of ch 3 with a sl st.
Row 2: Ch 3, turn, dc in each dc across, [2 dc, ch 2, 2 dc in corner], continue to dc across, repeating [ ] for corners, join with a sl st in the top of ch 3. Row 3: Repeat row 2, join Color B at sl st. Rows 4-6: Repeat Row 2, join Color C at sl st, end of row 6. Rows 7-9: Repeat Row 2, join Color A at sl st, end of row 9. 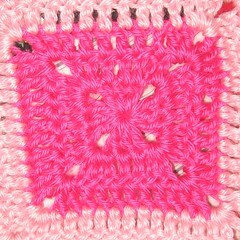 Row 10 – 31: Repeat pattern (1 row of Color A, 3 rows of Color B, 3 colors of C) through row 31 (the last row will be Color A). At the end of row 31, join Color B in sl st. ch 1. Row 32: ch 1, sc in back loop of each dc. 3 sc in corner ch. Repeat around, joining Color C in sl st.
Row 33: ch 1, sc in back loop of each sc, in corner [sc, 2 sc, sc]. Continue sc in back loop around, repeating [ ] in corners, join with a sl st and finish off. This entry was posted in crochet and tagged afghan, baby blanket, caron simply soft, crochet, free pattern, knit picks on March 4, 2009 by Jennifer Ofenstein. This is so pretty thank you for sharing your pattern. You do lovely work. Thank you again for your kind words! I’m really glad you like the blanket. 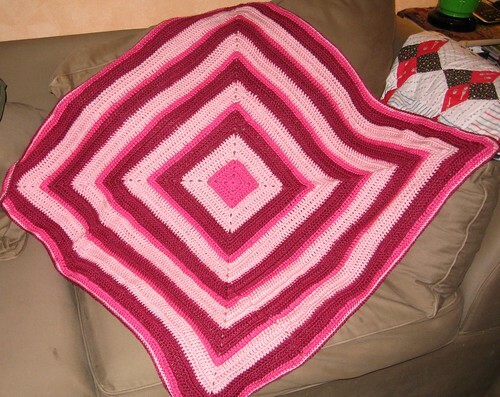 I’m going to start this blanket for my boss’ daughter. She’s expecting her first baby in April and her husband is a huge Detroit Lions fan so I’ll do it in baby blue, gray and white. It’s a beautiful pattern and I think it will work out perfectly! On a side note, my name is Jennifer as well and I always love seeing how other Jennifer’s sign their name. Beautiful signature! Love this pattern, I was just curious about the difficulty level. I am a beginner going into intermediate. Do you think that this afghan would be doable for my skill level? Absolutely, it’s doable! It’s a very simple pattern and I’m sure you’d do great with it. Good luck! 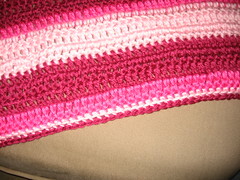 I’m finishing up my third “Strawberry Ice Cream” blanket. It has become my go-to baby blanket! I’ve made it in John Deere colors (by request), jungle colors, and bright colors (teal, berry, seafoam, white, gold). It’s been the only pattern that I’ve finished BEFORE the baby arrives. Thanks for sharing!